Halloween is right around the corner. There is pumpkin spice, scary haunted houses, and pumpkins everywhere! Along with those traditional October items, the time honored tradition of the Halloween costume can cause excitement for some people or consternation for others. For those of you that haven’t quite decided what to dress up as or have been procrastinating, take heart. 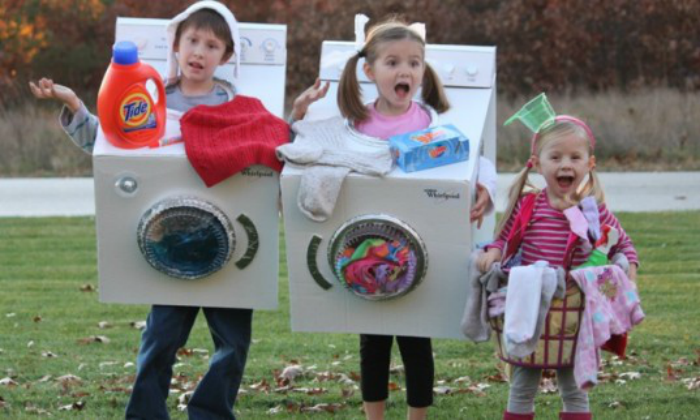 We have a list of original DIY costumes that won’t break your budget, and will be the hit of any Halloween party! Mean Girls was an iconic movie that brought us many quotable lines like “Ex-boyfriends are off-limits to friends. That’s just, like, the rules of feminism.” and “Raise your hand if you have ever been personally victimized by Regina George.” Regina George was one of the most memorable characters of the movie and dressing like her for Halloween would be easy. In one the sabotage scenes, Cady cuts holes in Regina’s white tank so her bra would show. Instead of being upset, Regina throws the tank on and rocks it for the rest of the day. For this costume, wear a black short skirt, a white tank top with two circle holes cut over the chest and black flats. If you don’t have blond hair then you can find a blond wig to complete the outfit. Another iconic movie that brings back great memories for most people from their childhood is Mary Poppins. Not only is the costume easy but it’s cute to boot! 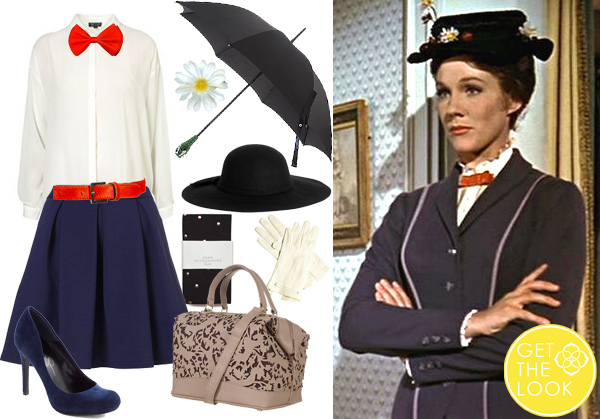 All you need is a black umbrella, navy full A-line skirt with a red belt, white button up with a red bow tie and a black hat with some sprigs of flowers attached to the brim. For those of you that enjoyed playing video games or computer game growing up, dressing up as your favorite character from your favorite game is a great way to make that nostalgic walk down memory lane. Where in the World is Carmen San Diego was a hit with kids that taught geography and reference skills. 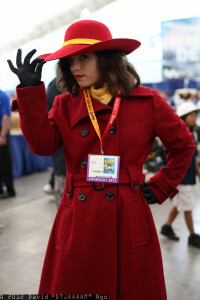 To dress up like the character of Carmen San Diego, all you need is a long red trench coat with a wide brim red hat with a yellow ribbon attached to the hat. Another nostalgic game that would provide some laughs and some inspiration is the Oregon Trail game. Dying of dysentery, shooting buffalo and fording a river were all common aspects of the game that made it fun to play. Dressing up as a character from the game would require old fashioned looking clothes. For women, a long dress with a white apron and a bonnet will do the trick. For men some old Levi jeans, a white shirt, brown vest and a bandana will work perfectly. Once you have assembled those components, create a sign that says, ”You just died of Dysentery” or any popular disease of your choosing from the game. Social media is everywhere now and so why not go as your favorite social media platform? 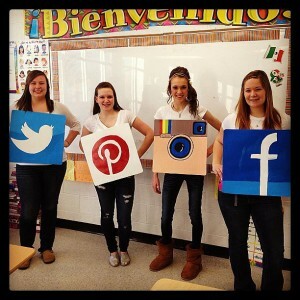 There are a few ways to convey your love for social media through different kinds of Halloween costumes. One easy way to be social media for Halloween is to buy some heavy duty cardboard and cut out a square large enough to paint the icon of your favorite social media platform. Attach a string on both ends of the square so it can hang comfortably around your neck. A second costume option is to create the Instagram background when posting photos. Cut out a large square with a smaller square cutout in the middle. Put the Instagram log on the top with a photo and your user name below it. At the bottom make sure to add how many likes the photos got and some comments! 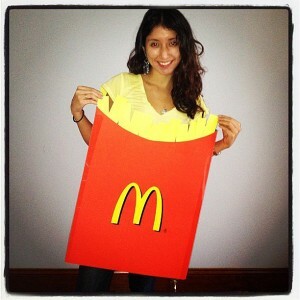 Moving away from the pop culture references, food costumes are the best and who doesn’t love McDonald’s fries? Create a large fry box out of red and yellow poster paper. You can attach yellow suspenders to the fry box to help keep it attached to the front of your body. 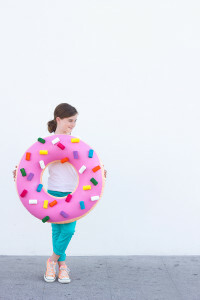 Another easy food to dress up as is a donut. Buy an inflatable tube and paint one side pink. Buy foam rollers and paint them all different colors to represent sprinkles and glue gun those to the tube. You can also attach a string to the tube so the donut can hang around your neck for stability. 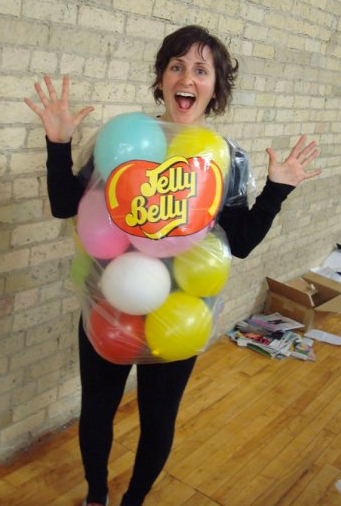 Another delicious costume idea is to dress up like a bag of jelly beans. The jellybean costume is super easy to make and doesn’t require any skill. Buy a large clear plastic bag and cut two leg holes in the bottom of the bag. Print out the Jelly Belly logo online and glue it to the front of the plastic bag. Buy different colors of small balloons and blow them up. Put the small balloons in the large clear bag and step on it and cinch it up at the top near your neck. Another fun way to celebrate Halloween is by dressing up with a group of people. Group costumes don’t always require a lot of work. 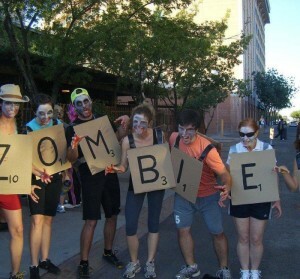 One good group costume is to grab enough people to spell and word and go as scrabble letters. Cut out large squares from cardboard and write a letter in black sharpie along with the point value. 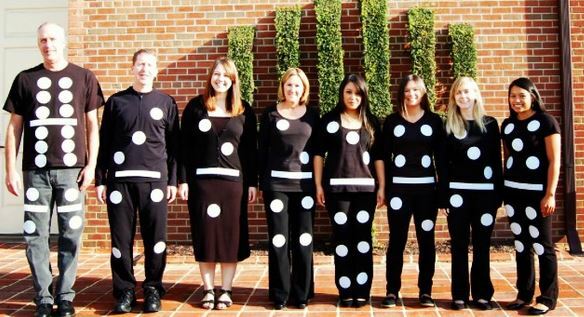 Another popular game that makes for a good group Halloween costume is dominos. Just dress everyone in black clothing and use some sticky tape and white paper to make the holes and the centerline. For all those procrastinators out there, it’s super easy to throw this one together at the last minute. For a group of men dressing up as the gang from King of the Hill just requires some jeans, shirts and cans of PBR. Also grab 7 friends to dress up as shark week. Buy grey shirts and write the name of each day of the week on the shirts. Dribble some red paint on the front and put on a hat in the shape of a shark. Costumes don’t always have to be elaborate in order to have fun this Halloween. Sometimes just a little bit of creativity can go a long way when getting dressed up for the spookiest night of year. Make sure to add any suggestions to our Twitter at https://twitter.com/puyallupcom. We would love to hear about your clever ideas!